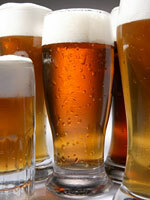 Even teenagers know that downing 12 beers in a single night isn't good for their bodies and can be dangerous. But a new study suggests that routine binge drinking like this may cause mental problems—including a reduced ability to think—that can last long after the hangovers have worn off. TUESDAY, October 19 (Health.com) — Even teenagers know that downing 12 beers in a single night isn't good for their bodies and can be dangerous. But a new study suggests that routine binge drinking like this may cause mental problems—including a reduced ability to think—that can last long after the hangovers have worn off. Frequent marijuana use also appeared to damage memory, according to the study, which was published in the journal Alcoholism: Clinical and Experimental Research. It's too early to say whether the mental deficits seen in the study are permanent or if they might be reversible with long-term abstinence from alcohol and drugs. Regardless, the findings suggest that the lingering effects of binge drinking could wreak havoc during a pivotal time in a young person's life. "The most important thing in kids' lives is school," says the lead author of the study, Robert J. Thoma, PhD, an associate professor of psychiatry at the University of New Mexico, in Albuquerque. "If you have a problem with sustained attention, then how are you going to do in math class?" "These kids are making things more difficult for themselves," he adds. However, the study couldn't show that binge drinking directly caused cognitive problems. It could be that preexisting cognitive problems—such as poor decision-making—lead to binge drinking, rather than vice versa. Thoma and his colleagues looked at three groups of teens: 19 who had been diagnosed with substance abuse, 14 who had a family history (but no personal history) of problem drinking, and 15 with no history of alcohol problems. Kids with substance abuse problems reported consuming an average of 13 alcoholic beverages on days when they drank. The other two groups of teens averaged one drink or less for each day they chose to consume. The teens' apparent cognitive problems increased with the extent of their alcohol use. Heavy drinkers scored significantly lower than the other groups of kids on measures of attention and the ability to make good decisions, multitask, and plan for the future (known as executive function). It didn't seem to matter how often the teens drank, but only how many alcoholic beverages they consumed on days when they did drink. In addition, smoking marijuana frequently appeared to have a negative impact on memory, the researchers found. "We know an awful lot about how alcohol affects adults, but we know very little about how it impacts kids," Thoma says. "I expected kids to be more resilient than adults. But it turns out that's not really the case." Susan Tapert, PhD, a professor of psychiatry at the University of California, San Diego, says that research suggests that the adolescent brain is more vulnerable to some of alcohol's effects, and less vulnerable to others. Teens “may be less likely to get sleepy with a certain amount of alcohol than an adult," says Tapert, who was not involved in the current study. "This is risky since it means a teen could stay up later drinking and possibly doing more dangerous things." These findings may serve as a wake-up call for teenagers who drink heavily (and their families), Tapert adds. "If we have data like these that suggest the kids who were using substances performed much worse on some important measures, then I think that information is important to pass along to young people." "I'm really hoping that the resilience of the adolescent brain will allow them to reverse the trend," Thoma says.